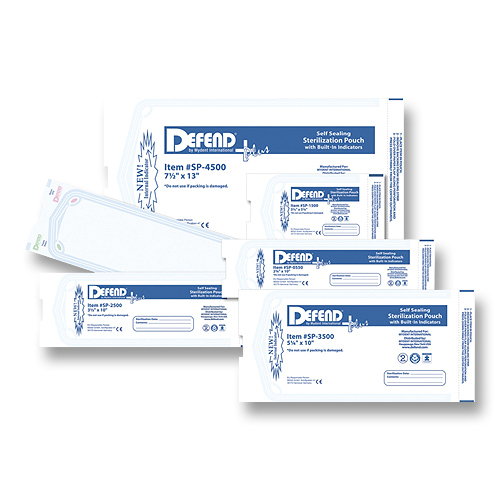 Sterilization Pouches - Size: 2.75" X 10"
Sterilization Wrap - Size: 2.75" X 10"
DEFEND PLUS pouches are constructed with a built-in, lead-free Internal Indicator, giving you peace of mind when it comes to the sterilization of your instruments. The Internal Indicator ensures the correct sterilization temperature is reached where you really need it ..inside the instrument compartment. This eliminates the need for an internal indicator strip inside the pouch with your instruments. In addition, the external indicator will still change color when the optimal temperature is reached. 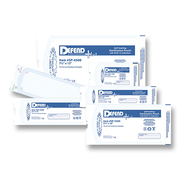 Awarded "Best Product 2010" by Dental Product Shopper and "Editors' Choice" by the Dental Advisor.